Do you hate yourself? 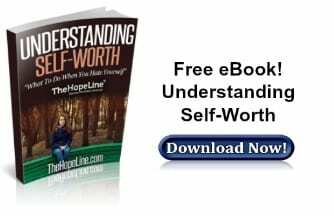 Stop negative thoughts with these bible verses of hope for self worth to help you overcome the never ending cycle of self-hate. Psalm 139:13-16 – You made all the delicate, inner parts of my body and knit me together in my mother’s womb. Thank you for making me so wonderfully complex! Your workmanship is marvelous—how well I know it. You watched me as I was being formed in utter seclusion, as I was woven together in the dark of the womb. You saw me before I was born. Every day of my life was recorded in your book. Every moment was laid out before a single day had passed. Ephesians 1:4 – Even before he made the world, God loved us and chose us in Christ to be holy and without fault in his eyes. 1 John 3:1 – See how very much our Father loves us, for he calls us his children, and that is what we are! Psalm 18:19 (ESV) – He brought me out into a broad place; he rescued me, because he delighted in me. Psalm 147:11 – The Lord’s delight is in those who fear him, those who put their hope in his unfailing love. Psalm 139:17-18 – How precious are your thoughts about me [emphasis added], O God. They cannot be numbered! I can’t even count them; they outnumber the grains of sand! And when I wake up, you are still with me! Ephesians 2:10 (NLT) – For we are God’s masterpiece. He has created us anew in Christ Jesus, so we can do the good things he planned for us long ago. Romans 8:1-2 – So now there is no condemnation for those who belong to Christ Jesus. And because you belong to him, the power of the life-giving Spirit has freed you from the power of sin that leads to death. Zephaniah 3:17 (ESV) – The Lord your God is in your midst, a mighty one who will save; he will rejoice over you with gladness; he will quiet you by his love; he will exult over you with loud singing. Psalm 30:10-11 – Hear me, Lord, and have mercy on me. Help me, O Lord. You have turned my mourning into joyful dancing. You have taken away my clothes of mourning and clothed me with joy. Isaiah 61:1 & 3 – He has sent me to…bestow on them a crown of beauty instead of ashes, the oil of joy instead of mourning, and a garment of praise instead of a spirit of despair.